The NWEA MAP is comprised of a set of adaptive, online assessments in Reading, Language Usage, and Mathematics. "When taking a MAP® test, the difficulty of each question is based on how well a student answers all the previous questions. As the student answers correctly, questions become more difficult. If the student answers incorrectly, the questions become easier. In an optimal test, a student answers approximately half the items correctly and half incorrectly. The final score is an estimate of the student’s achievement level" (NWEA Parent Toolkit, 2015). Student's achievement level is recorded in a RIT score. "RIT Tests developed by NWEA use a scale called RIT to measure student achievement and growth. RIT stands for Rasch UnIT, which is a measurement scale developed to simplify the interpretation of test scores. The RIT score relates directly to the curriculum scale in each subject area. It is an equal-interval scale, like feet and inches, so scores can be added together to calculate accurate class or school averages. RIT scores range from about 100 to 300. Students typically start at the 180 to 200 level in the third grade and progress to the 220 to 260 level by high school. RIT scores make it possible to follow a student’s educational growth from year to year" (NWEA Parent Toolkit, 2015). You can learn more about these scores through the RIT Reference Charts PDF from NWEA. It not only highlights examples from each MAP test but, all of the covered topics. You can compare this information to the topics covered on the HSPT; Kaplan created a set of quick reference charts to highlight all of the topics tested. What are the key features of the MAP? 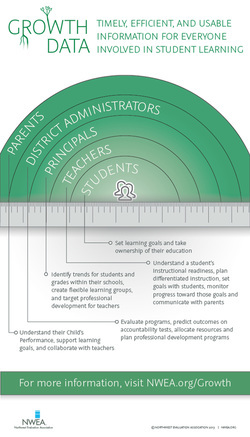 how MAP links to instructional content to inform individual learning paths. Interested in learning more? NWEA maintains an excellent channel on Vimeo with extensive resources such as this overview. What type of data will I receive about my students? Schools can access a variety of reports through NWEA for teachers, principals and leaders. NWEA produces an excellent document that highlights all of the reports available through the administrative portal: Reports Portfolio. You can then view the national norming data from 2015 which breakdown the RIT scores not only by test but, at three intervals during the academic year (i.e., beginning, middle, and end of the year).